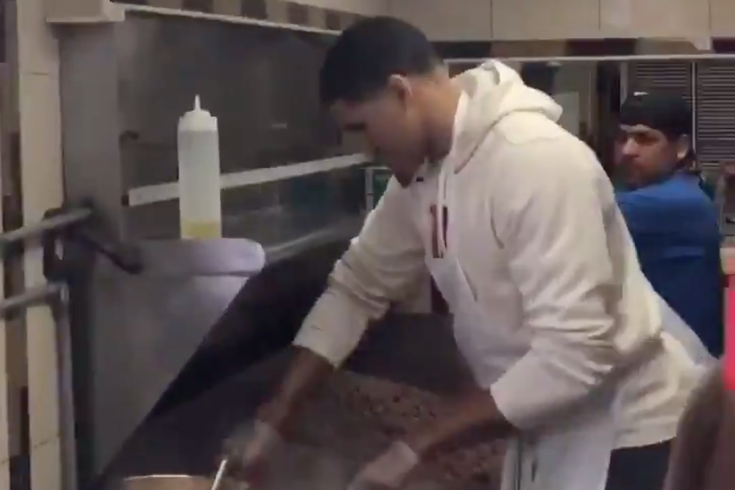 Tobias Harris assembles a cheesesteak at Dalessandro's in Roxborough. In the grand discussion of Philly’s cheesesteaks, Dalessandro’s has come to be regarded as the thinking man’s steak. The Roxborough joint is, at the current cultural moment, the spot True Philadelphia People point to as the best in the city. Apparently, someone let Philadelphia 76ers teammates Tobias Harris and Boban Marjanovic know about the steak shop’s local reputation, because the two were spotted at Dalessandro’s on Thursday, opening doors and slinging steaks. Being seen at the wrong steak shop in Philly can send the wrong message to fans, so this is a very good sign if these two stay in the city long-term. Of course, it shouldn’t be too surprising that Harris and Marjanovic found one of the city’s best steaks. MORE SPORTS: Which Sixers overwhelmed or underwhelmed this season? During his first week in the city, Harris headed down to South Philly Barbacoa, the much-lauded taco spot in the Italian Market, while Marjanovic made his way to Zahav, Michael Solomonov’s James Beard-level Israeli restaurant. Bobi and Tobi were making cheesesteaks at Dalessandro’s which make them true Philadelphians. Keep them here forever, they know what’s up. Why did I just see Boban Marjanovic 🏀standing outside of Dalessandro’s 🤔 It’s 9am did he want a cheesesteak 😂 He looked lost! It doesn’t look like the stress of the upcoming playoffs is getting to two of the newest Sixers. The NBA postseason starts Saturday for the Sixers, when they host the Brooklyn Nets in Game 1 at 2:30 p.m. at the Wells Fargo Center.